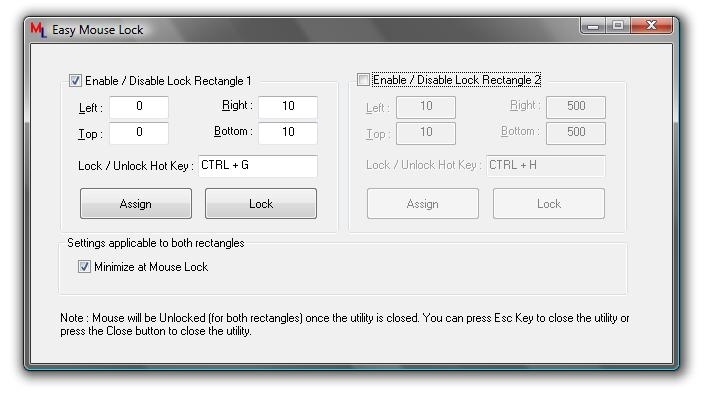 Lock Mouse cursor with Easy Lock Mouse Utility within user defined rectangle.Mouse is released when utility closed.The main screen of the utility can be minimised automatically when mouse cursor is locked.Trial Version does not have any nagging popups.Register for $5.00 and get free upgrades.  Mouse Cursor once locked in a defined rectangle can be unlocked by closing the Mouse Lock utility usinng keyboard or by logging off the signed on user. Pressing Alt+Tab or any other key combination will not unlock mouse cursor from the defined co-ordinates just close the mouse lock utility to unlock the mouse cursor from the defined co-ordinates. The utility supports two rectangles inn which you can lock the mouse cursor. 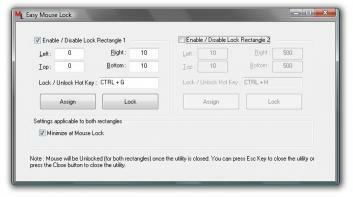 Toggle Mouse Lock Unlock with System Wide Hot Key or Shortcut Key.